VACHT antibody LS-C18490 is an unconjugated rabbit polyclonal antibody to human VACHT (SLC18A3). Validated for IHC. SLC18A3 / VACHT antibody was raised against synthetic peptide from the C-terminus of human VAChT conjugated to BSA. Recognizes human VAChT both in the CNS and PNS. 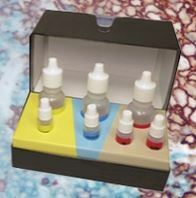 Absorption with 10-100 ug immunogen per ml diluted antiserum abolishes staining. Recommended for Frozen sections of human small intestine. Suitable for use in Immunohistochemistry (frozen sections). Immunohistochemistry: 1:800-1:1200 using FITC conjugates as secondary antibodies; Incubation Time Overnight at 2-8?C.